This is one of my favorite mini quilts I made: it measures 11" x 13.5" and it is heavily quilted. I used a crayon to add the clouds because my youngest son thought the landscape needed them. I took this photo at my oldest son's place. He saw the quilt, loved it, so I had to give it to him. Speaking of my son's place, it is spotless. He works very long hours, is a single parent to two amazing boys, and still makes sure the place is clean. I am so proud of him for many reasons, this one included. Michael is a fantastic cook. 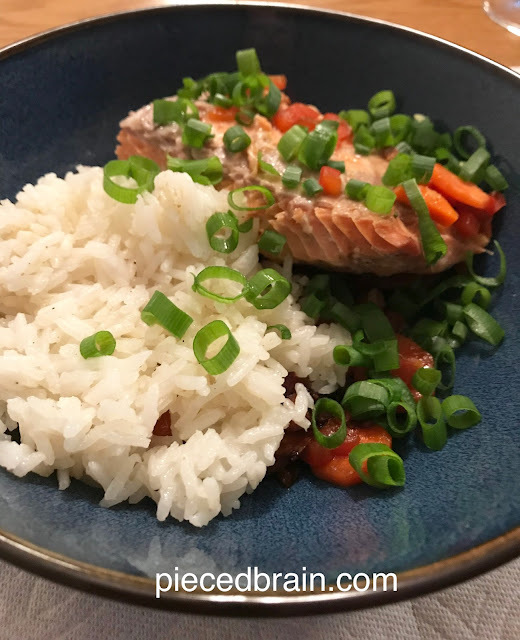 I am visiting him this weekend and had a taste for fish - instead of taking me to a restaurant, he cooked it for me. A mother's dream! 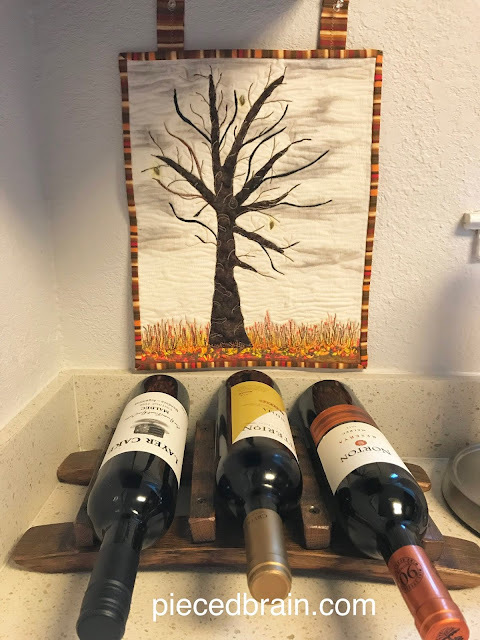 Going back to Fall quilts, this is another of my favorites and it will soon adorn my dining room table. I always wanted to make a double wedding ring quilt and this one turned out perfect! That background print is fantastic! 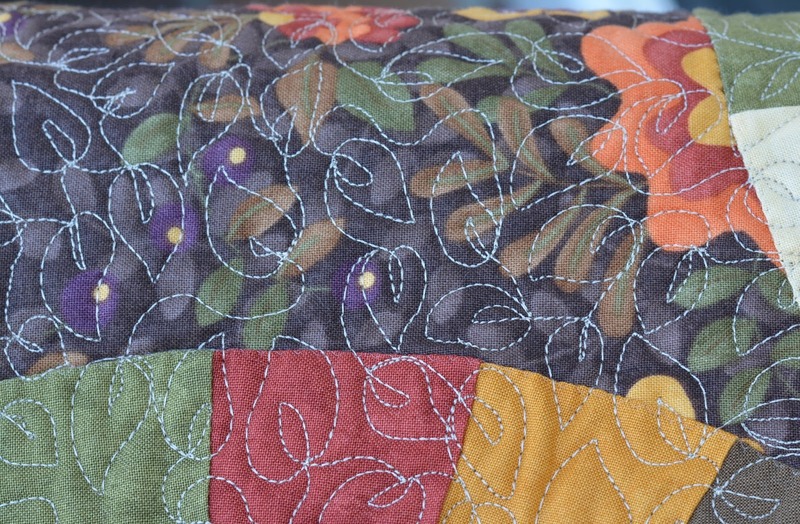 I patiently free motion quilted it with thousands of leaves to mimic the forest floor during Autumn. Click here to read more about how I made this table topper. Pumpkins and Patches is a free Fall quilt pattern I designed for Hoffman Fabrics last year. Click here for details on how to download this pattern. Can you tell I am trying to get you in the mood for Fall sewing? I hope it is working! I love your mini, your table topper and this pumpkin pattern looks wonderful, too. Oh, and that food looks delicious! Thank you! Yes, Michael is a fantastic cook! Thank you! 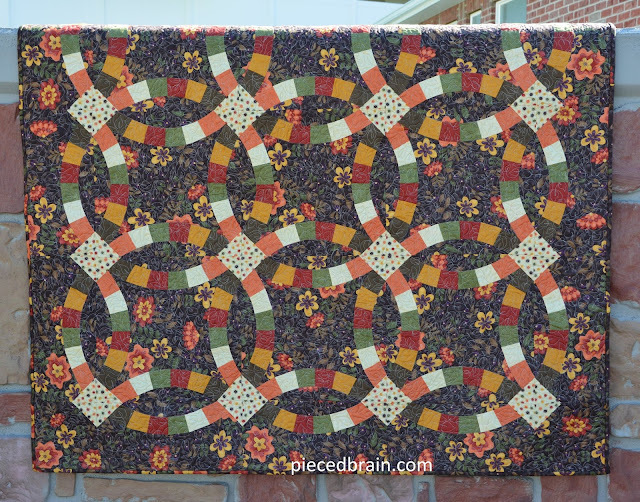 The wedding ring quilt is one of the things I look forward to every Autumn!